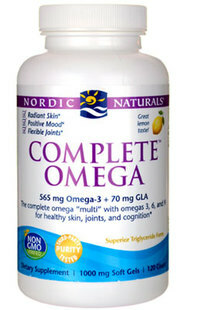 Complete Omega™ - 1000 mg, 60 softgels (Nordic Naturals) - Penn Herb Co. Ltd. Complete Omega™ offers omega-3s from fish oil, omega-6 GLA from borage oil, and omega-9 oleic acid. This balanced blend promotes heart health, brain function, and a positive mood, and offers support for healthy joints and skin. No fishy aftertaste. 2 soft gels daily with food, or as directed by your health care professional or pharmacist. CONSULT WITH YOUR PHYSICIAN BEFORE USING THIS PRODUCT IF YOU ARE ALLERGIC TO IODINE, USE BLOOD THINNERS OR ANTICIPATE SURGERY.